In one of the Russian proverbs it says, “If you don’t know how deep the river is, don’t step in”. But that was quickly forgotten by three girlfriends, when they stepped into an enormous mansion with full of surprises. One little accident turns into a nightmare threatening a seemingly uneventful Christmas night. But as you know, the appetite grows during a meal, and these friends, apparently, are too hungry for adventure. “Body” is an indie suspenseful thriller, written and directed by Dan Berk and Robert Olsen, which follows three friends who are sitting at home finding themselves bored so much that they decided to transform their full of calamity Christmas evening into a night ride. On their way, Cali (Alexandra Turshen) tells her two other friends, Holly (Helen Rogers) and Mel (Lauren Molina) that there is a mansion nearby belonging to one of her friends, and now, due to Christmas time is empty. Of course, Cali, who has a playful imagination, lies when a man after an “innocent” assault falls down the stairs. And that is when she had to confess to her friends about the mansion. Shortly after, when they found the man dead, the friends started to make up a plan that will support their story when they call to police. Cali, who appears to be the lead, orchestrates the entire rehearsal prior to the police arrival, but misses one important point – that the man was still alive. Remember when in the beginning I mentioned about the appetite that grows during a meal? So, what happens next is surely what no one could have expected it coming, when Cali, all of a sudden decides to fix the problem – if they presumed that the man was already dead, so why not make it happen? Holly, who seems has a kind heart, objects against Cali’s plan. But the problem is, Cali is so busy digging a hole for the man that she forgets that she may be the one who fill fall into it. “Body” is relatively a short film, with almost an hour and ten minutes of running time which was enough to tell the entire story thoroughly. It has very simple and straightforward plot, however, well narrated. It is also interesting how the story develops, when one insane event takes over another one, even more impossible to believe. Three friends seem to be too close to each other, but one event turns everything upside down, where in the end, they won’t be able to trust each other, or will they? 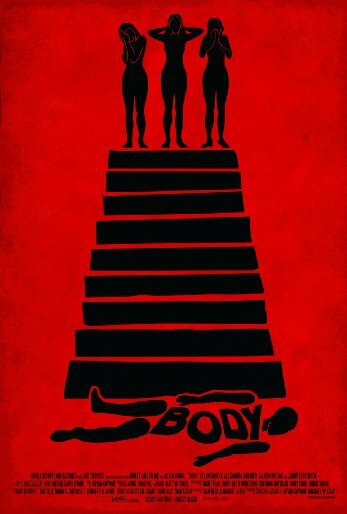 In conclusion, “Body” has an interesting point to deliver, but hardly has a moral in it, at least, I hope so. The main cast, without trying hard, portray their characters convincingly enough to keep you busy throughout the film. It is surprisingly engaging and easy going feature which is good enough for a Friday movie night. So in case you make your way to the theater, pay attention to the opening scene when the 911 operator promises that everything will be alright. Because it will be… but not for everyone…. “BODY” open on April 22, 2016 in Toronto at the Carlton theatre and on April 26, 2016 on VOD & Digital.